Pant-y-Celyn Holiday Cottages07800762735work Self-cateringPant-y-celyn is a cosy ground floor Studio Apartment situated in the quiet village of Llwyncelyn which is only 20 minutes walk from the shingle beach at Gilfach-yr-Halen and the stunning Cardigan Bay Coastal path. Just 2 miles away is the Georgian Harbour town of Aberaeron which has recently been Awarded Best Place to stay in Wales, with unique shops and many good restaurants providing the finest foods from locally sourced ingredients. Inland, you can explore the lush Aeron Valley and visit the National Trust Mansion at Llanechaeron. To the south is the Teifi valley, offering walking, kayaking and fishing in the river renowned for its sewin and salmon. Llwyncelyn has a village store for groceries/newspaper/post office. Pant-y-celyn is a cosy ground floor Studio Apartment situated in the quiet village of Llwyncelyn which is only 20 minutes walk from the shingle beach at Gilfach-yr-Halen and the stunning Cardigan Bay Coastal path. 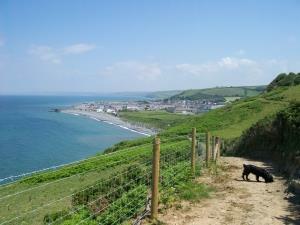 By Road: From the Georgian town of Aberaeron- Take the A487 towards Cardigan for 2miles. Once arriving into the village of Llwyncelyn, pass the petrol station on your right then take the next left sign posted Oakford. Drive approximately 200yds. We are the last bungalow on the left before leaving the village.